I am the first to admit that I love a rich, vibrant color photo. But sometimes, less is more. Sometimes when you pull the color out of a photo, your eye goes straight to the subject and the entire feeling of the photo changes. That’s why I also adore a great black and white. This photo was taken at the majestic Tarrytown House Estate in Westchester, New York. The forecast for this July wedding was for showers, but Alanna was cool as a cucumber as she got ready to become a bride. 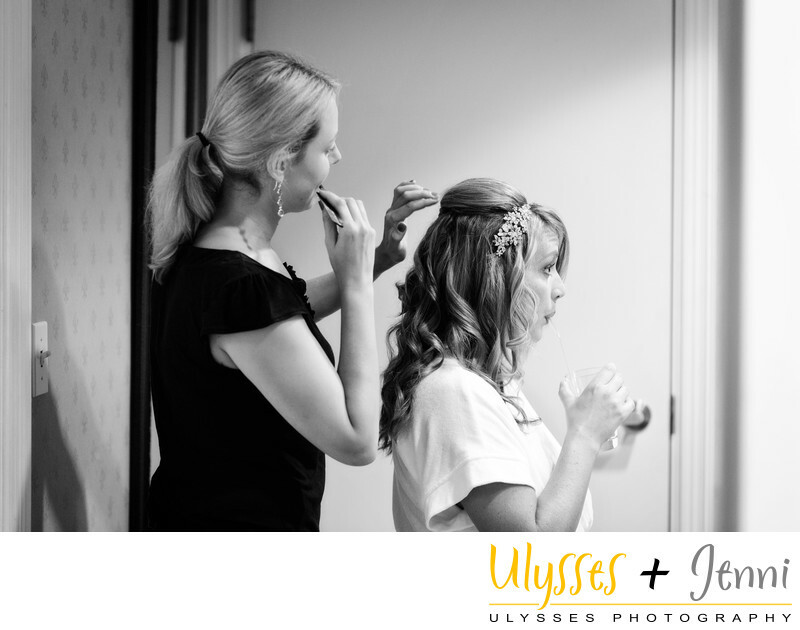 As she had her hair and makeup done by Erica de Waal of the Lief Beauty Boutique, the room was calm and quiet. Alanna was wise to sip water to stay well hydrated before the day got started, as that is often harder to do later when all the action of the wedding day starts! Of course, having a straw handy makes it possible to sip without causing any smudges to that perfectly-applied lipstick. Don’t be fooled by that calm demeanor you see in this photo, however. Once things got rolling and the dress went on, the excitement flowed. There was such great energy in the room! Soon afterward, Marcos got to see his lovely bride for a first look in the privacy of their estate for the day. Of course, he was awed by her Justin Alexander gown. The evening was full of rich Irish and Latin cultures, family love, music and dancing, all in the beautiful castle-like surroundings. It was definitely a night to remember!